This article is about the American painter. For the American poet, see John Trumbull (poet). For the American politician, see John H. Trumbull. For the Australian cricketer, see John Trumble. 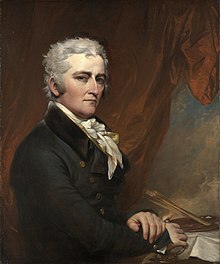 John Trumbull (/ˈtrʌmbəl/; June 6, 1756 – November 10, 1843) was an American artist during the period of the American Revolutionary War and was notable for his historical paintings. He has been called The Painter of the Revolution. Trumbull's Declaration of Independence (1817), one of his four paintings which hang in the United States Capitol Rotunda, was used on the reverse of the commemorative bicentennial two-dollar bill. Trumbull was born in Lebanon, Connecticut, in 1756, to Jonathan Trumbull and his wife Faith (née Robinson) Trumbull. His father served as Governor of Connecticut from 1769 to 1784. Both sides of his family were descended from early Puritan settlers in the state. He had two older brothers, Joseph Trumbull, the first commissary general of the Continental Army in the Revolutionary War, and Jonathan Trumbull Jr., who would become the second Speaker of the House of the United States. The young Trumbull entered the 1771 junior class at Harvard College at age fifteen and graduated in 1773. Due to a childhood accident, Trumbull lost use of one eye. This may have influenced his detailed painting style. As a soldier in the American Revolutionary War, Trumbull rendered a particular service at Boston by sketching plans of the British and American lines and works. He witnessed the Battle of Bunker Hill. He was appointed second personal aide to General George Washington, and in June 1776, deputy adjutant-general to General Horatio Gates. He resigned from the army in 1777 after a dispute over the dating of his officer commission. In 1780, with funds depleted, Trumbull turned to art as a profession. He traveled to London, where upon introduction from Benjamin Franklin, Trumbull studied under Benjamin West. At West's suggestion, Trumbull painted small pictures of the War of Independence and miniature portraits. He painted about 250 in his lifetime. On September 23, 1780, British agent Major John André was captured by Continental troops in North America; he was hanged as a spy on October 2, 1780. 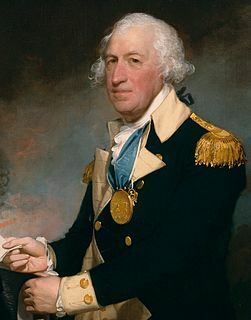 After news reached Great Britain, outrage flared and Trumbull was arrested, as having been an officer in the Continental Army of similar rank to André. He was imprisoned for seven months in London's Tothill Fields Bridewell. After being released, Trumbull returned to the United States in a voyage that lasted six months, ending late January 1782. He then joined his brother David in supplying the army stationed at New Windsor, New York during the winter of 1782–83. In 1784, following Britain's recognition of the United States' independence, Trumbull returned to London for painting study under West. While working in his studio, Trumbull painted Battle of Bunker Hill and Death of General Montgomery in the Attack on Quebec. Both works are now in the Yale University Art Gallery. In July 1786, Trumbull went to Paris, where he made portrait sketches of French officers for the Surrender of Lord Cornwallis. With the assistance of Thomas Jefferson, serving there as the American minister to France, Trumbull began the early composition of the Declaration of Independence. Over the next 5 years Trumbull painted small portraits of signers, which he would later use to piece together the larger painting. If the signer was deceased, a previous portrait would be copied, as was the case with Arthur Middleton, whose head position stands out in the painting. While visiting with each signer or their family, Trumbull, always looking for funding, used the occasion to sell subscriptions to engravings that would be produced from his paintings of the American Revolution. While in Paris, Trumbull is credited with having introduced Jefferson to the Italian painter Maria Cosway; they became lifelong intimate friends. Trumbull's painting of Jefferson, commissioned by Cosway, became widely known due to a later engraving of it by Asher Brown Durand, which was reproduced. Trumbull's Declaration of Independence painting was purchased by the United States Congress, along with his Surrender of General Burgoyne, Surrender of Lord Cornwallis, and General George Washington Resigning His Commission, all related to the Revolution. All now hang in rotunda of the United States Capitol. Congress reportedly authorized only funds sufficient to purchase these four paintings. The Sortie Made by the Garrison of Gibraltar, 1789. This was once owned by the Boston Athenaeum and is now held by the Metropolitan Museum of Art in New York City. General George Washington at Trenton, oil on canvas, 1792. Yale University Art Gallery. Trumbull encountered hard times in which he was failing to sell his paintings individually; in 1831 he sold a series of 28 paintings and 60 miniature portraits to Yale University for an annuity of $1,000. After many years of trying to create income from his painting, he had finally found a way to sustain himself from his art. This is by far the largest single collection of his works. The collection was originally housed in a neoclassical art gallery designed by Trumbull on Yale's Old Campus, along with portraits by other artists. His portraits also include full lengths of General Washington (1790) and George Clinton (1791), now held in New York City Hall. New York also bought his full-length paintings of Alexander Hamilton (1805, the source of the face on the $10 bill) and John Jay. In 1791 Trumbull was elected a Fellow of the American Academy of Arts and Sciences. He painted portraits of John Adams (1797), Jonathan Trumbull, and Rufus King (1800); Timothy Dwight and Stephen Van Rensselaer (both at Yale), Alexander Hamilton (one in the Metropolitan Museum of Art and one in the Boston Museum of Fine Arts, both taken from Ceracchi's bust), a self-portrait (1833), a full-length of Washington, held at Charleston, South Carolina; a full-length of Washington in uniform, General George Washington at Trenton, (1792, at Yale); and portraits of President and Mrs. Washington (1794), in the National Museum of American History. Trumbull was painted by Gilbert Stuart and many others. 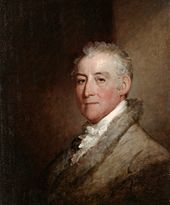 In 1794 Trumbull acted as secretary to John Jay in London during the negotiation of the treaty with Great Britain, which largely settled the boundary with Canada and began cotton export. In 1796 he was appointed by the commissioners sent by the two countries as the fifth member of a commission charged with carrying out the seventh article of the Jay Treaty, which mediated claims by American and British merchants and the opposing government stemming from actions which occurred during the war. Shortly after the end of Trumbull's service on this commission, he traveled to Stuttgart to pick up the completed engraving of the Battle of Bunker's Hill. On the return trip he passed through Paris and carried the first dispatch from the XYZ Affair out of France. 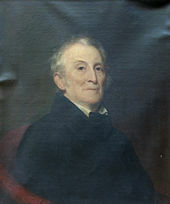 Trumbull was appointed president of the American Academy of the Fine Arts in New York City, serving for twenty years, from 1816 to 1836. Emphasizing classical traditions, Trumbull did not get along with the students. At the same time, his painting skills declined. In 1825 many of the students withdrew, founding the National Academy of Design. Unable to accommodate to changing tastes, the American Academy later closed in 1839 after a second fire destroyed its collections. Trumbull wrote his autobiography, which he published in 1841. He died in New York City at the age of 87 on November 10, 1843. Trumbull was originally interred (along with his wife) beneath the Art Gallery at Yale University, which he had designed. In 1867, the collection of his works were moved to the newly built Street Hall. His and his wife's remains were reinterred on those grounds. The Trumbull Gallery was later razed. 1965, the John Trumbull Birthplace in Lebanon, Connecticut, was declared a National Historic Landmark. 1968, a John Trumbull commemorative postage stamp was printed. ^ Johnston, Elizabeth Bryant (1882). "John Trumbull". Original Portraits of Washington, including Statues, Monuments and Medals. p. 66. OCLC 3303313. ^ "Gentleman John Trumbull". Time Magazine. 1956-10-29. Retrieved 2008-02-17. ^ Sketch of British and American Lines and Fortifications in Boston Area by John Trumbull, 1775. ^ a b c d e f g One or more of the preceding sentences incorporates text from a publication now in the public domain: Chisholm, Hugh, ed. (1911). "Trumbull, John" . Encyclopædia Britannica. 27 (11th ed.). Cambridge University Press. p. 324. ^ a b c Trumbull (1841), pp. 288–94. ^ Jaffe (1975), p. 50. ^ Heleniak, Kathryn Moore. "Benjamin West and John Trumbull". Fordham University. Archived from the original on 2016-03-20. Retrieved 2017-11-19. ^ Jaffe (1975), pp. 53–54. ^ Trumbull (1841), p. 88. ^ Dunlap, David W. (2006-12-06). "In New York, Taking Years Off the Old, Famous Faces Adorning City Hall". The New York Times. Retrieved 2007-01-07. ^ "Book of Members, 1780–2010: Chapter T" (PDF). American Academy of Arts and Sciences. Retrieved August 7, 2014. ^ Jaffe (1975), pp. 177–82. ^ Jaffe (1975), pp. 264–75. ^ Dunlap, William (1918). A History of the Rise and Progress of the Arts of Design in the United States (Vol 3). C. E. Goodspeed & Co. pp. 52–57. Retrieved 2008-02-17. Trumbull, John (1841). Autobiography, Reminiscences and Letters of John Trumbull from 1756 to 1841. New York: Wiley and Putnam. Weir, J. F. (1901). John Trumbull, A Brief Sketch of His Life, to which is added a Catalogue of his Works. New York: C. Scribner's sons. Retrieved 2008-02-16. Durand, John (1881). "John Trumbull". American Art Review. Boston. ii (2): 181–191. Murray, P. & L. (1996). Dictionary of Art and Artists. Penguin Books. ISBN 0-14-051300-0.
Cooper, Helen A. (1983). John Trumbull: The Hand and Spirit of a Painter. New Haven, CT: Yale University Press. ISBN 978-0894670244. Jaffe, Irma B. (1975). John Trumbull, Patriot-Artist of the American Revolution. Boston, MA: New York Graphic Society. ISBN 9780821204597. Sizer, Theodore (1950). The Works of Colonel John Trumbull, Artist of the American Revolution. Yale University Press. Wikimedia Commons has media related to John Trumbull. The Winterthur Library Overview of an archival collection on John Trumbull. Union List of Artist Names, Getty Vocabularies. ULAN Full Record Display for John Trumbull. Getty Vocabulary Program, Getty Research Institute. Los Angeles, California. The Battle of Princeton was a battle of the American Revolutionary War, fought near Princeton, New Jersey on January 3, 1777 and ending in a small victory for the Colonials. General Lord Cornwallis had left 1,400 British troops under the command of Lieutenant Colonel Charles Mawhood in Princeton. Following a surprise attack at Trenton early in the morning of December 26, 1776, General George Washington of the Continental Army decided to attack the British in New Jersey before entering the winter quarters. On December 30, he crossed the Delaware River back into New Jersey. His troops followed on January 3, 1777. Washington advanced to Princeton by a back road, where he pushed back a smaller British force but had to retreat before Cornwallis arrived with reinforcements. The battles of Trenton and Princeton were a boost to the morale of the patriot cause, leading many recruits to join the Continental Army in the spring. Horatio Lloyd Gates was a retired British soldier who served as an American general during the Revolutionary War. He took credit for the American victory in the Battles of Saratoga (1777) – a matter of contemporary and historical controversy – and was blamed for the defeat at the Battle of Camden in 1780. Gates has been described as "one of the Revolution's most controversial military figures" because of his role in the Conway Cabal, which attempted to discredit and replace General George Washington; the battle at Saratoga; and his actions during and after his defeat at Camden. Jonathan Trumbull Sr. was the only man who served as governor in both an English colony and an American state, and he was the only governor at the start of the American Revolutionary War to take up the Patriot cause. Trumbull College at Yale, the town of Trumbull, Connecticut, and Trumbull County, Ohio are named after him. Hugh Mercer was a Scottish soldier and physician. He initially served with the Jacobite forces of Bonnie Prince Charlie, and with the British forces during the Seven Years' War, but later became a brigadier general in the Continental Army and a close friend to George Washington. Mercer died as a result of his wounds received at the Battle of Princeton and became a fallen hero as well as a rallying symbol of the American Revolution. Richard Butler was an officer in the Continental Army in the American Revolutionary War, who later was killed while fighting Indians in a battle known as St. Clair's Defeat. New England has no official flag, but there have been many historical and modern banners used to represent the New England Colonies or the six states of New England. There are some variations, but common designs include a plain colored field with a pine tree in the canton. The eastern white pine is the most common symbol of New England and often represents that tree's former importance in shipbuilding and New England's maritime culture. 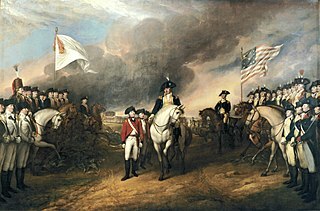 The Surrender of General Burgoyne is an oil painting by John Trumbull. The painting was completed in 1821, and hangs in the rotunda of the United States Capitol in Washington, D. C.
The Death of General Warren at the Battle of Bunker's Hill, June 17, 1775 refers to several oil paintings completed in the late 18th and early 19th century by the American artist John Trumbull depicting the death of Joseph Warren at the June 17, 1775, Battle of Bunker Hill, during the American Revolutionary War. Warren, an influential Massachusetts physician and politician, had been commissioned as a general but he served in the battle as a volunteer private. He was killed during or shortly after the storming of the redoubt atop Breed's Hill by British troops. The Death of General Mercer at the Battle of Princeton, January 3, 1777 is the title of an oil painting by the American artist John Trumbull depicting the death of the American General Hugh Mercer at the Battle of Princeton on January 3, 1777 during the American Revolutionary War. The painting was Trumbull’s first depiction of an American victory. It is one of a series of historical paintings on the war, which also includes the Declaration of Independence and The Capture of the Hessians at Trenton, December 26, 1776. General George Washington Resigning His Commission is a large-scale oil painting by American artist John Trumbull of General George Washington resigning his commission as commander-in-chief of the Continental Army on December 23, 1783 to the Congress of the Confederation, then meeting in the Maryland State House at Annapolis, Maryland. The painting was commissioned in 1817, started in 1822, finished in 1824, and is now on view in the United States Capitol rotunda in Washington, D. C., along with three other large-scale paintings by Trumbull about the American Revolutionary War. The Capture of the Hessians at Trenton, December 26, 1776 is the title of an oil painting by the American artist John Trumbull depicting the capture of the Hessian soldiers at the Battle of Trenton on the morning of December 26, 1776 during the American Revolutionary War. The focus is on General George Washington aiding the mortally wounded Hessian Colonel Johann Gottlieb Rall. Nearly 900 Hessians were captured at the battle. 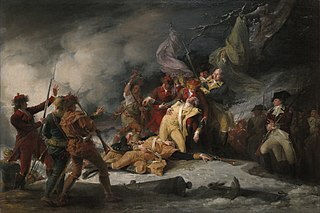 It is one of Trumbull's series of historical paintings on the war, which also includes the Declaration of Independence and The Death of General Mercer at the Battle of Princeton, January 3, 1777. The painting is on view at the Yale University Art Gallery in New Haven, Connecticut. General George Washington at Trenton is a large full-length portrait in oil painted in 1792 by the American artist John Trumbull of General George Washington at Trenton, New Jersey, on the night of January 2, 1777, during the American Revolutionary War. This is the night after the Battle of the Assunpink Creek, also known as the Second Battle of Trenton, and before the decisive victory at the Battle of Princeton the next day. The artist considered this portrait "the best certainly of those which I painted." The portrait is on view at the Yale University Art Gallery in New Haven, Connecticut, an 1806 gift of the Society of the Cincinnati in Connecticut. It was commissioned by the city of Charleston, South Carolina, but was rejected by the city, resulting in Trumbull painting another version. Thomas Cheesman (1760–1834) was a British engraver who worked in London. He was a student of the Italian engraver Francesco Bartolozzi, who was working in London at the time. Washington at Verplanck's Point is a full-length portrait in oil painted in 1790 by the American artist John Trumbull of General George Washington at Verplanck's Point on the North River in New York during the American Revolutionary War. The background depicts the September 14, 1782 review of Continental Army troops Washington staged there as an honor for the departing French commander Comte de Rochambeau and his army. 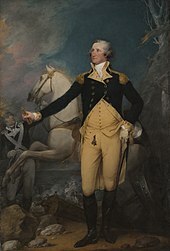 George Washington is a large full-length oil painted by American artist John Trumbull in 1790.